Posted by Amanda Hicks on Tuesday, February 27th, 2018 at 10:20am. 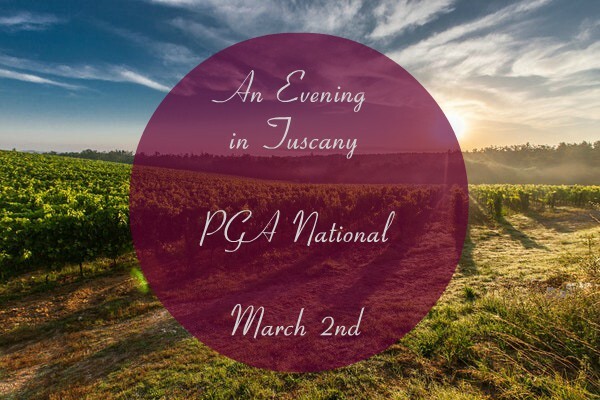 Join world-renowned Tuscan wine distributor Marco Molesini at PGA National Resort & Spa this Friday, March 2nd, for an evening of fine wine and delectable food from Tuscany, Italy! Marco will be sharing his personal selection of the region's best wines. Starting at 6 p.m. enjoy tastings accompanied by hors d'oeuvres. After you've had a chance to test a bit and socialize, sit down to a delightful Italian dinner paired with the wines of your choice. Later on in the evening, take your bid in a live auction for a trip to Tuscany! The Tuscany Experience trip is for 4 people and includes airfare, villa accommodations, vineyard tours and more. It is valued at $15,000. The featured wines will be available for purchase toward the end of the night. Don't miss out on the chance to meet Marco Molesini, taste some of the best wine in the world, and possibly win the trip of a lifetime! PGA is located at 400 Avenue of the Champions, West Palm Beach, FL 33418.